Eastwood City held a contest last July 2010. Those who wanted to join were asked to submit an entry that included 20 reasons to love Eastwood City. Participants had the freedom to be as creative as they can be with their entries. I submitted a comic blog entry and luckily, my entry got picked as one of the winners to receive an Eastwood Cinemas Season Pass! I was truly excited as I love going to the movies. This photo was taken during the awarding night, courtesy of Eastwood City. Awarding of prizes were held last August 08, 2010 at the Manor Superclub at Eastwood City. At the time, winners of the season pass were only given a token, a large replica of the season pass. We were told that the actual pass would take some time to process. Two weeks later, the season pass was ready for claiming. 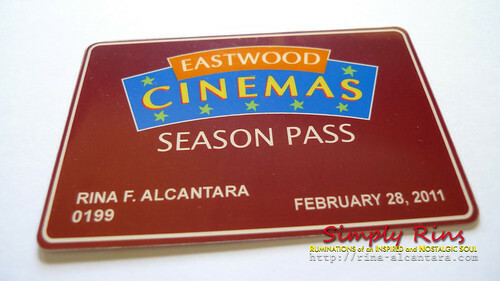 The actual Eastwood Cinemas Season Pass. Conditions were printed at the back of the card. 1. Present this card at the Eastwood Cinema ticket booth. 2. This card is non-transferable. 3. May be suspended on special days or events. Perks are not valid should they coincide with any other Eastwood Cinema Promo. 5. Valid only once per movie. 6. If found, please return to the Cinema office at the 4/F City Walk II, Eastwood City. 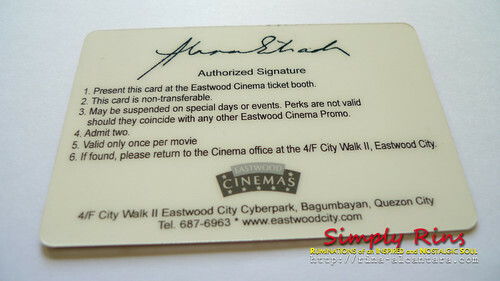 The card entitles the bearer to 6 months of unlimited movie pass at any Eastwood cinema, including the Ultra 7. I've been meaning to try their Ultra 7 cinema and so after claiming the season pass, partner and I, went straight to Eastwood Mall to watch The Expendables that was showing at Ultra 7. 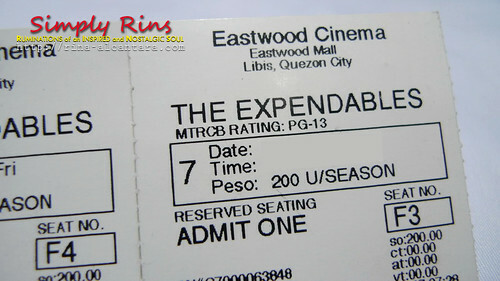 Our movie tickets for The Expendables at Ultra 7. Watching at Ultra 7 cost Php400 per person. That includes unlimited popcorn and drinks. After presenting the season pass at the ticket booth, we were asked to pay for Php200 each. I was a bit disappointed at first because I thought we'll get the whole package for free! We were told that the Php200 would cover the unlimited popcorn and drinks. I asked if we could forego with the food and drinks. Sadly, we couldn't. Nonetheless, partner and I still thought that it was worth it. Our Ultra 7 experience didn't disappoint us. I got more curious with the season pass after our first movie. 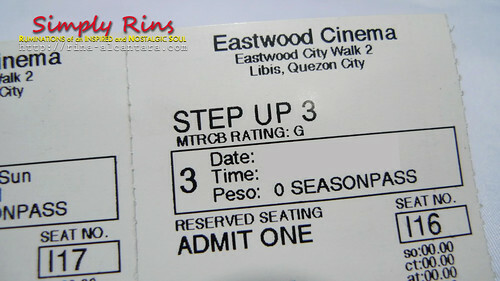 And so for our next movie date, we decided to watch Step Up 3 at a regular Eastwood cinema. Our movie tickets for Step Up 3. 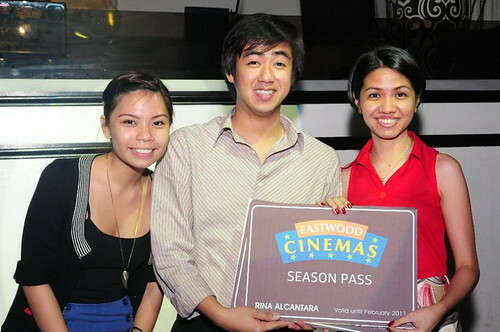 With the season pass, watching at any regular Eastwood cinema is totally free! By the following week, partner and I were anticipating the showing of Despicable Me. Luckily, it was showing in 3D at Eastwood cinema 6. 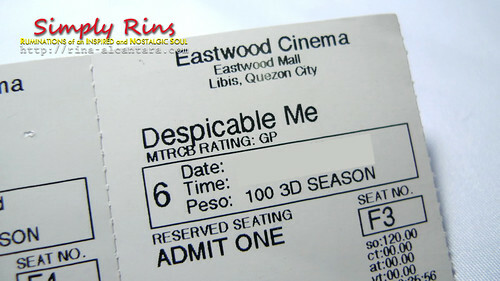 Our movie tickets for Despicable Me in 3D at Eastwood cinema 6. Watching in 3D at Eastwood cinemas costs Php350 each. This includes a tumbler of popcorn and 16oz of either iced tea or soda. With the season pass, we were asked to pay Php100 each for the food and drink. Not bad! Since I'm really not into popcorn, I found this a better deal than the Ultra 7. Although, it would be nice to watch really long films with the comfort of a recliner seat. As per inquiry, the Eastwood Cinemas Season Pass cannot be purchased. It is only given to special partners or in my case, given as an award to a contest or promo.